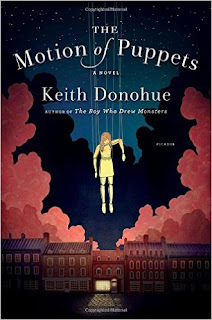 What a wonderful book is The Motion of Puppets written by Keith Donohue! While I was reading this book I tried to guess the books this author had previously read for writing such a touching book. Profound, plenty of meanings The Motion of Puppets can be "read" and you will see by yourself at many levels. First of all: let's ask to ourselves who a puppet is, apart of course to be a beautiful toy. It's an inanimate toy in general maneuvered by someone else who will give him life. A puppet is driven by someone else to do and to be exactly what he wants and what he desires that this puppet must be: the owner of the puppet can changes his/her clothes, he can changes hair, he can changes everything of this puppet. Read it in metaphorical sense and you will obtain also what it can happens to a weak person. The puppet couldn't never say anything, because he/she wouldn't have force to do that, no mouth, or to be someone listened by the society. The force of a puppet raises only in this: who there is behind him/her. There is someone more strong than the same puppet able to give him/her dignity, strength, value, and all the sentiments she/he will perform that night during the show. This book can also be read socially. A society of many puppets, driven by the desire of gratification, driven by the desire of being all similar to our neighbors, without to search for our own differences. We should all have similar thoughts and we should all stay calm and quiet. The book according to my point of view can be also read like it. And trust me when I tell you that I am not wrong. The part of the book in which for example a puppet, Noe, the most intolerant one to be and live like a puppet needs a certain "operation" to its head for removing some bees entered for case while they were re-building the puppet during the reconstruction read by me like a sort of "revolution". She couldn't hear anymore all that noise and she needed to open her brain, but opening her brain what does it mean? Thinking with our own head and saying what we think. The puppet, as told by the other puppets should have kept all her/his thoughts in her/his head because in opposite case what can happens to the world and to the society if these thoughts go out? Well, I found the passage pretty interesting. 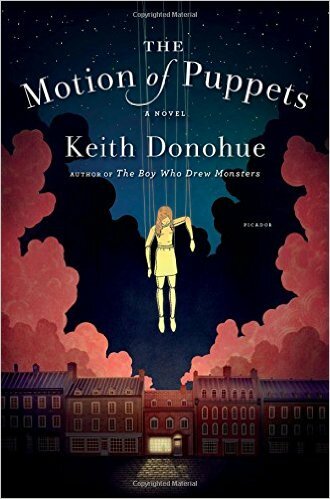 Surely Donohue has read the Metamorphosis by Kafka and while I read that the puppets loved to performed The Trial by Franz Kafka I smiled thinking that in this case we were anyway in a Metamorphosis and change. A sort of Wizard of Oz by Baum but without to find characters as happens in Baum's book that asks for specific treats of their characters, but differently people transformed for the purpose of re-creating the reality and plasticity that can be found just by the old remembrance of people realistically alive once. Are, these puppets sad? As said before: no. Most of them don't love to remember who they were and they don't remember who they were in some cases. In other cases they remembered but they don't mind anymore. Just few puppets would want to go away, refusing to be, as in the society, many sheep or many puppets. For Kay Harper new, happy married girl with her wonderful husband Theo it happened while she was staying with her husband to Quebec for performing with a circus. Kay is an acrobat and this occasion succulent. She loves the magical atmosphere of a circus and she loves mainly to spend her free time with her beloved husband. Theo is a translator and he is spending his time at the moment with a translation from a book written by Muybridge, This man dead more than a century ago interested at the motion of human and not only, bodies. Their life is happy like can be the life of a romantic new couple. Theo in love for Kay so badly although of course he still needs to discover some aspect of her character, and vice-versa. Their love very powerful and quick, they became groom and bride without to think too much. Kay is powerfully attracted by a toy shop located at rue Saint-Paul. In particular she is attracted by an ancient puppet. Oh: she loves to look at that one with the desire of buying it, and she confess all to her husband. But...What to do? This shop is systematically closed. Possible that no one can be seen or spotted somewhere close to it? Upsetting. One night Kay enters in the shop and starts Theo's story and at the same time Kay's sweet and terrible own metamorphosis. Can be considered a death the departure by a dimension in this case of a person, so with a human body to a puppet? Of course it is. It's a transformation, a metamorphosis. There is an end and a new beginning. Death and re-born under another semblance that just the ones loved that person a lot can recognize in a new shape. There is life also in a puppet after all. In a common puppet. A puppet can be considered alive. They're appreciated, loved, treated well. Just this give them a reason for being "alive" for us all. In this case you will discover how happy are the puppets of this book when no one can see them. 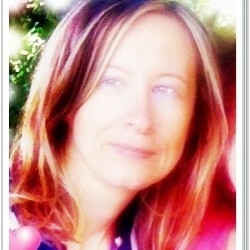 Again we find a big devotion and love: the one of Theo for her Kay! that I loved so much for the wonderful expressions and phrases of love expressed in the book. Such tenderness from a man is terribly moving. Theo is destroyed when he understand that Kay can't be found anywhere and she is missing. No one knows where she went after with some colleagues left the restaurant after a good evening spent all together. No one knows if she knew anyone in the city. Theo excludes every possible other men, other stories, friends where she could have stayed in the city or the return to their city. No, impossible. Kay becomes a phantom and Theo, destroyed, returns to NYC where he re-starts to work as a professor. But he is strained, absent, he talks with the guys of the publishing house. He can't complete the translation so soon as hoped because with the mind is somewhere else. At the publishing house they understand and give more time to him. His colleague are distant. No one wants to talk to him. His tragedy mustn't effect other people. Students joke with it: "Sure that he didn't kill her?" "Who knows..."
Prof.Mitchell a devoted man and teacher of Greek and Latin, a man of few words, starts to be his friend and later Egon another member of the cast of the circus, reaches his friend telling him that he slept in the bedroom upside the toy shop where Kay disappeared and he bring him very good news. That shop wasn't normal, that shop was weird. A cursed place, animated. The return to Quebec, the discovery of some new puppets in Vermont, (the second departure for Kay...) the call with the mom of Kay. "I recognized my daughter Theo...On TV. Please, that one is Kay I am sure of it. Please help me..."
The three men all motivated will leave for this farm where are now located these puppets, but what will happen will be poetically sad but also powerful. Meeting someone you thought you had lost forever, discovering the great simplicity of getting lost and transformed by the circumstances. It's simple to lose your self and at the same time to be transformed or killed metaphorically. I won't reveal you the end of the book but I can tell you something: what Theo knows for sure is that a man won't never stop to love the woman he loved so baldy although someone changed him in many ways, because love can reach her under many aspects and shapes. The end is impressively beauty. And it teaches us the strength of love, able to fight also when the impossible become possible, the surreal become only the language you can speak and recognize. I was to my favorite city bar when I picked up this title months ago. It was my idea to read this book and write my review for the book launch but the illness and death of my dad changed the cards on the table of Life. What I thought for sure when I requested this book was this: if it is written well it is a masterpiece. The cover is powerful. There is Kay, transformed in a puppet and waiting to be moved by someone else more big than her. There is behind her a big farm with a light. The light of the night, able to give life to lifeless puppets during the day and new hopes and some hours of freedom from their immobility. Most people can find attracting that light but that attractive light would mean also danger if a human wants to stop by in a wrong moment? That I hope someone will create a movie from this book as beautiful as this book is. You can be sure: The Motion of Puppets has a great story and great message. I love this book so badly and I want to thank NetGalley and the publishing house for this dream.